Sometimes we all need some comfort food, am I right? Whether it’s because we’ve had a long and stressful work day, or the kids are driving us bonkers, delicious food seems to comfort the soul. For me, comfort food often means a pasta dish of some kind. Maybe growing up in an Italian household conditioned me to love pasta eternally, or maybe it’s just that damn delicious! 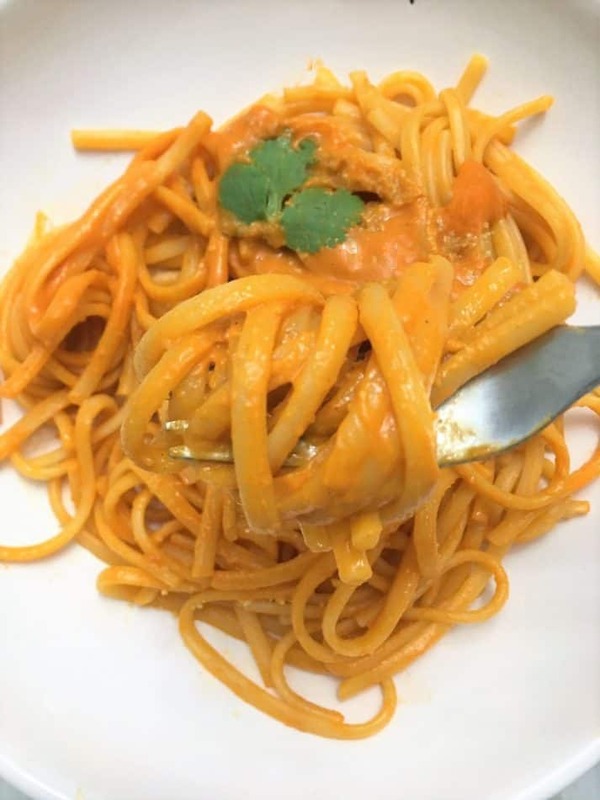 This time, I’ve got a moderately spicy, roasted red pepper pasta dish for you. And just like the plate says, it is super YUM! 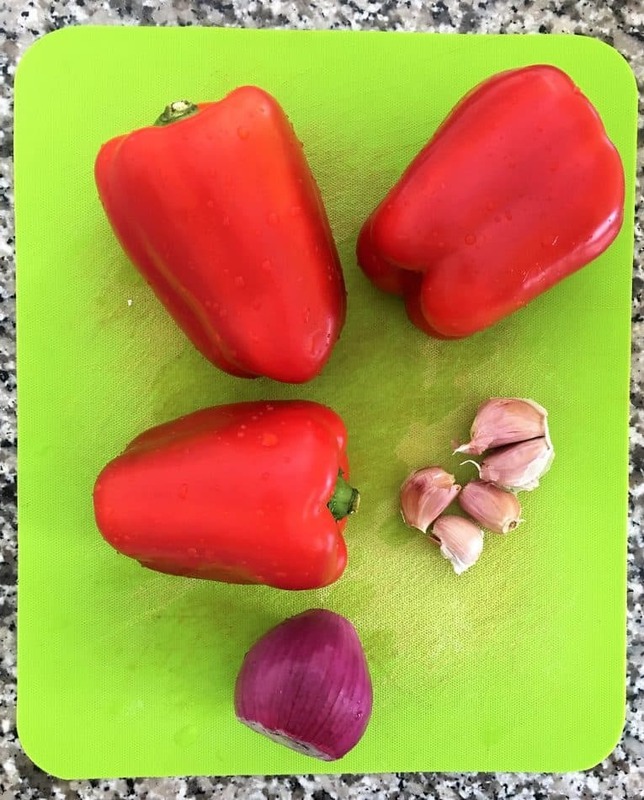 How do you make roasted red pepper sauce from scratch? First, cut your peppers in half and remove the seeds. Then cut your onion into quarters, but leave the skins on your garlic. Nothing to prepare here. Add all the veggies to a lined baking tray, your peppers hollow side down. Roast your veggies until the pepper skins are mostly blackened. Then remove from the oven. This should take around 20-25 minutes. Now you can easily remove the skins from the peppers. You’ll notice that the blacker skins remove easiest, requiring little to no effort at all. Now you can also peel the skins from your garlic cloves. These will also remove super easily after roasting. Once your veggies are prepped, toss them into your blender, along with all remaining sauce ingredients and process until smooth and creamy! That’s it! Super simple creamy sauce. Meanwhile, cook your pasta according to the package directions, using gluten free pasta if needed. Drain and return to the pot and pour enough sauce over your cooked noodles to prevent them from sticking. You may use the remaining sauce to ladle over each bowl when serving. Then garnish your roasted red pepper pasta with fresh basil or parsley and some Vegan Parmesan Cheese if desired. If you want extra heat, you may also garnish with chili flakes. Enjoy! 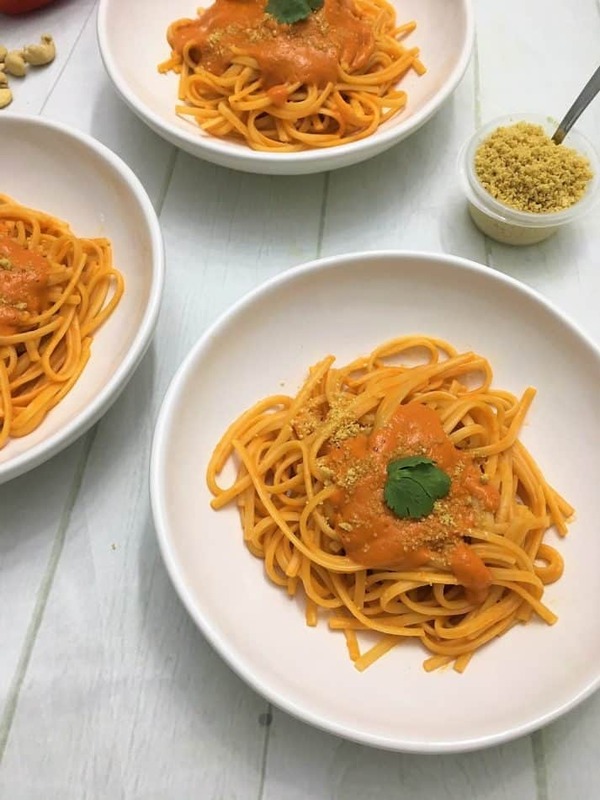 Hope you enjoy this roasted red pepper pasta dish, and I’d love to hear your feedback in the comments below. Want more delicious comforting pasta dishes? Give some of these a try! 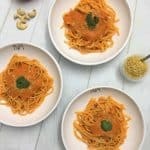 Comfort food made healthier with this spicy, roasted red pepper pasta sauce made from scratch, on your table in under one hour. Preheat your oven to 475 degrees roast and line a large baking tray with parchment paper. Then add your peppers (hollow side down), onion and garlic to the tray and roast until peppers are blackened, approx. 20 minutes. 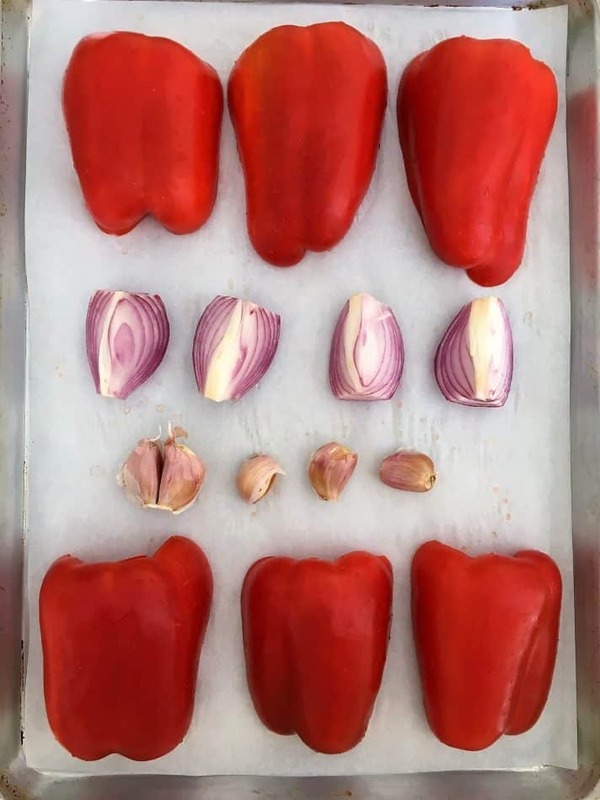 Remove from oven and set aside for a few minutes to cool, before peeling your peppers and garlic. Then add them to a high speed blender, along with all remaining ingredients (except the pasta) and process until smooth and creamy. Meanwhile, bring a large pot of generously salted water to a boil. Then cook your pasta according to package directions. Drain and return to the pot. Quickly pour about one third of your sauce over the pasta and mix well to prevent your noodles from sticking. 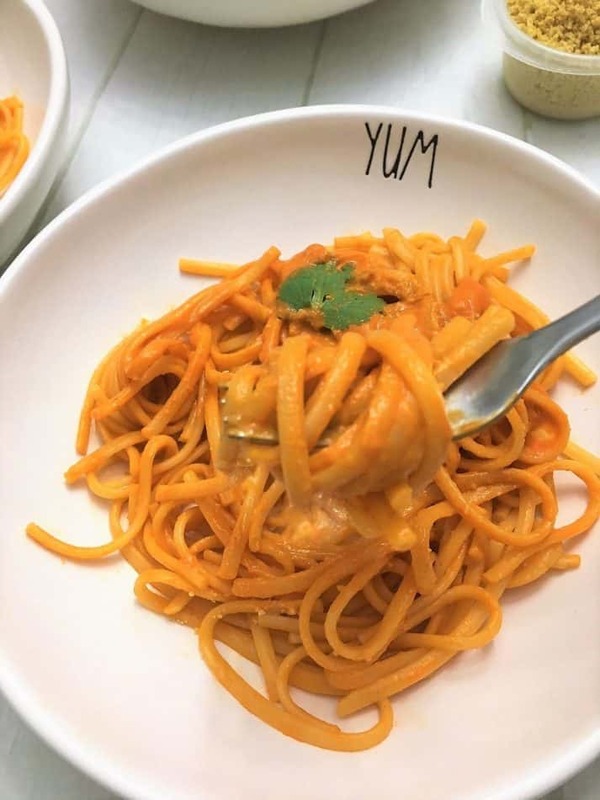 Then serve your noodles with an extra scoop of the red pepper sauce in each bowl. Garnish with Vegan Parmesan Cheese if using. I think pasta is just that damn delicious! 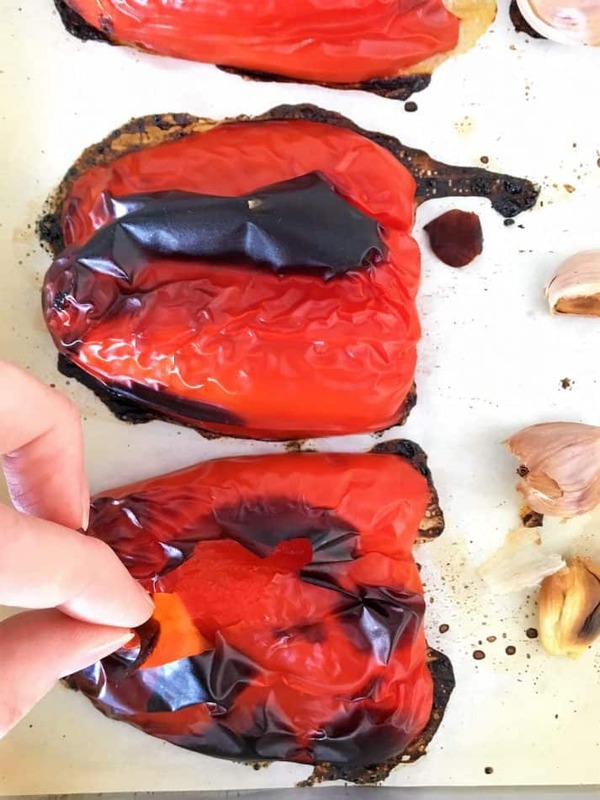 I love roasted red pepper sauces and I love that you roast them halved, and seeded. 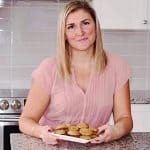 I usually do them whole, which is harder in my small toaster oven. I’m going to try your method next time!! Thanks! Thanks for the feedback Luci. Hope you enjoy! I love roasted red peppers. To make them a sauce and pair with pasta sounds amazing. Such a great recipe and way for me to always use up extra bell peppers! This looks super yummy! Love adding roasted veggies to pasta, so much flavor!